Snake Vasuki is closely associated with Hindu God Shiva. Vasuki is also referred as the king of the Nagas and is seen around the neck of Shiva. Vasuki is the eldest son of Kashyapa and Kadru. Puranas state that the serpent king became the string of the bow used by Shiva to destroy the three cities or Tripuradahana. He is also worshipped during all Naga Pujas and especially during Nag Panchami. In some exclusive paintings of Vasuki, the Naga is depicted with numerous heads. He is described as the thousand-headed king of serpents. Mahabharata states that Vasuki resides in the palace of Varuna, the sea god. The churning of ocean, or Samudra Manthan, is an important incident in Hindu Puranas and Snake Vasuki – the king of Nagas performed an important role in it. The Devas (demigods) and Demons (Asuras) obeying the orders of Sri Hari Vishnu, started preparation for the churning of the cosmic ocean to obtain Amrit – the nectar – that would make them immortal. The Mandara Mountain was chosen as the axle but they could find a rope that would go around the huge mountain. So the Devas and Asuras approached Vasuki, who agreed to be the rope for churning. 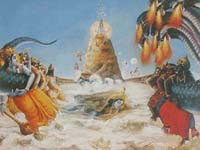 The Asuras held the head of Vasuki and Devas held the tail. An interesting story associated with churning of ocean states that Garuda was sent to invite Vasuki for the churning of ocean. Garuda was the arch rival of snakes but still he agreed to invite Vasuki. Garuda did not properly honor Vasuki and ordered him to participate in the churning of ocean. Vasuki resided in the palace of the sea god, Varuna. Vasuki asked Garuda to carry him to the spot fast. Garuda agreed to carry him on his beak. Garuda took the middle part of Vasuki and flew up into the horizon but the tail and head remained on the ground. Garuda then folded the huge snake into two and flew up into the sky but the result was the same. Garuda could not carry Vasuki and returned with him. Finally, Shiva stretched his arm into the sea and Vasuki took the form of a bangle and reached the spot of the churning of ocean. Another interesting story associated with the serpent is the one relating it with Iron Pillar in Delhi. It is said that the Iron Pillar in Delhi rested on the head of Vasuki and this lead to the stability of the kingdom. Once one king tried to dig up the pillar and all he could see was blood. It is said that the iron pillar could never be fixed properly and soon the kingdom was captured by Muslim kings.